It isn't unusual to hear oldies bleating about Working For Families and how much money their adult children are getting that they don't need. Probably to each other as they flash their Super Goldcard to get a 'free' ferry trip somewhere. In AUSTRALIA. Yes. The welfare state now pays out money to enhance Kiwi pensioner's holidays to the Gold Coast. But in a rich irony called 'reciprocity', one of the many ironies inherent in the fiasco welfare has become, holiday-making Aussies over 60 will be able to enjoy handouts same-age Kiwis can't in their own country!! Wah,wah. Quick get Peters onto it. The Supergold card must be available from 60. It's not fair. Wah, wah. In regard to welfare reform my focus has always been on the DPB for the reasons that 1/ children are being disadvantaged, sometimes very badly 2/ this benefit is at the heart of inter-generational dependence and 3/ it has the greatest potential for reform and improved lives in the process. While I am very familiar with the history, statistics, reasons for being on and other aspects of sickness and invalid benefits I have spent far less time talking about them. But a lot of time thinking about them. Their reform is absolutely essential but much more fraught, in terms of hardship and politics. Sometimes I wonder if they aren't being handled by the wrong bureaucracy. That is, shouldn't they be part of the health system? If they were, perhaps more focus would go on getting people better, more rigorous diagnosis and attention to trends. As it stands well people are lumped together with unwell people and are all seen under the same roof by the same people. People with no expertise in matters physical or psychological. If the money for sickness and invalid benefits was coming out of DHB funding you can bet that the focus on why more and more people are going on them would sharpen up pretty fast. Which leads me to a further thought. Money is very tight in Health. It is also capped, whereas MSD funding is not. Does Health tacitly sign people over to the responsibility and cost of MSD because there isn't money available for whatever it would take to get them functioning? This must be right to a degree. That is why various governments have tried programmes like Pathways to Health, bumping beneficiaries up public waiting lists in the Counties Manakau system I recall. Some individuals may have been helped by these initiatives but overall the trend upwards continues. 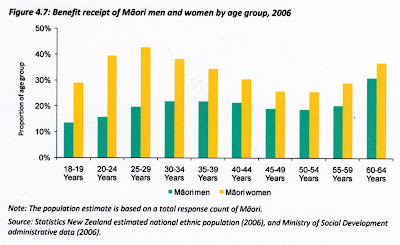 The percentage of working age New Zealanders reliant on one of these benefits continues to climb. Suggestion: The existing funding pool for sickness and invalid benefits could be transferred over to the relevant DHB and thereafter managed but capped. Money saved by reducing the caseload (the current levels are artificial) and used elsewhere in the health system or invested in resources to further assist beneficiaries back to good health. Mental health exponents will tell you how badly under-funded their area is. This would give them a chance to up their funding and treat people to the best of their capacity which is surely what health professionals want to do. Gordon Campbell - is anyone on the left prepared to deal with realities? There is opinion, and there is wilful misrepresentation. Yesterday, Key-the-moderate was engaged in the age-old right wing election year rhetoric of welfare bashing. More in sorrow than in anger though, of course. The current system was “broken”. It was “unaffordable” And it was “unsustainable ” – unless most of the wilder ideas of the Welfare Working Group are put into action. A Cabinet working team and government departments are now to be tasked with furthering the WWG recommendations. These welfare alarums are bogus, of course. Only three years ago, this same allegedly broken system had benefit levels down at record lows. Sickness and invalid benefit levels were at record highs and the DPB levels were not far off flat-lining. Only unemployment benefit levels were "at record lows". Yet the welfare reforms, as recommended by the WWG, barely touch on the unemployment benefit. The main determinant of beneficiary numbers is a functioning economy where jobs are available – and that’s something for which Key takes no responsibility whatsoever. Instead, the government seems to be hellbent on making beneficiaries keep their side of the social contract – while taking no responsibility as managers of the economy, for failing to keep its side of the bargain. In that respect, the government’s welfare reform rhetoric is as dishonest as the timeframe that Key chose to introduce the topic at yesterday’s press conference. In 1970, Key twice pointed out, only 2% of the working age population were on benefits, while 13% were on benefits today. Conclusion: the system is making it too easy for people to get on, and stay on benefits. No concession that he is measuring those beneficiary numbers at the employment trough of the worst global recession since the 1930s, and in the wake of one of New Zealand’s worst natural disasters. The main determinant of beneficiary numbers can not be a "functioning economy". If that was the case, after the economic boom under Labour, there wouldn't have been ten percent of the working age population dependent. There would have been 2 or 3 maybe. The system is making it to "too easy for people to get on, and stay on benefits" regardless of the state of the economy. Were things really as wonderful 41 years ago as he was intimating? Back in the 1970 that he carefully chose for comparison, there was no Domestic Purposes Benefit at all. Is Mr Moderate saying that the DPB has been a mistake? Of course it has been a mistake. 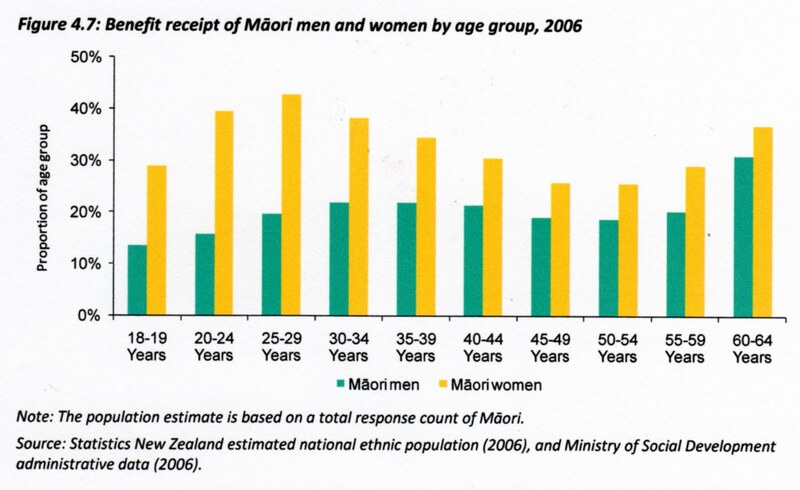 Any benefit that has 40 percent of all Maori women aged between 20 and 30 dependent on the state is a drastic error of policy. The Prime Minister says the Government will forge ahead with some of the Welfare Working Group's recommendations, aimed at pushing 100,000 beneficiaries into work within a decade. The target is to have 100,000 fewer people on benefits in 10 years. The pool of beneficiaries is far from static. People are constantly flowing in and out of it. 1/ The target would also include discouraging people from going onto benefits 2/ Many people leave a benefit for reasons other than to go to a paid job so 3/ the target does not rest on ' pushing' 100,000 people into work. That is why, by the way, the target is far too low. Only a few years back, early 2008, there were 80,000 fewer people on benefits but the deeply entrenched dependency remained. Reform has to focus sharply on the long-term, inter-generational group. The only recommendation he ruled out immediately yesterday was for solo mothers who had another child while on the benefit to return to work when that child was 14 weeks old. But he would not rule out setting another age for that to happen - indicating the Government could be considering the group's second option of a return to work when the child was 1. There is an obvious reason I don't need to spell out why one year is too long if a beneficiary is in the habit of producing babies to avoid work. Work-test at the earliest opportunity. Then the disincentive to add children is strongest. 14 weeks was picked because it falls in line with what most working parents face. 14 weeks paid parental leave and then a return to work or make their own arrangements. If work and childcare is available why should sole parents be any different? He said significant reform of the system would be steered by a group of high-ranked ministers and the proposed reforms set out before the election. I am more hopeful about that statement only because it indicates that Key understands he will need a group to push through reforms. One person alone will have a great deal of difficulty dealing with the opposition (remember what happened to Katherine Rich). What opposition? Auckland Poverty Action Group spokeswoman Sue Bradford said the line-up of high-powered ministers charged with the reforms showed National planned significant change. "They are clearly going to do a 'beneficiaries and bludgers' dog-whistle campaign. And we will fight them on it the whole way. We have to because we can't afford to have those recommendations in place." She said it amounted to semi-privatisation of the welfare system and would worsen the plight of children who were already struggling. The Welfare Justice Group is a collection of many named and unnamed welfare advocates who will pull out all stops to turn the public against reforms. When churches and so-called child welfare advocates start crying foul the impact cannot be under-estimated. They think they are well-motivated. They think they have God on their side. But their short-term easy remedies for reducing the poverty of beneficiaries will only aggravate the problem of welfare dependence further. Their's is the recipe we have been following for four decades. The Budget set aside $40 million for the reforms, likely to be the system's largest shakeup since it began in 1938. Dear me. Already spending money to save money? Looks like government business as usual. Oh, I suppose I could go along with a massive media campaign to tell New Zealanders that there will be no more DPB from April 1, 2012. Could you live with that? This word extreme is a strange one. On the one hand New Zealanders seem to embrace the idea of extreme activities or extreme sports or extreme fun. Extreme branding brings adventure tourists to our shores. Imagine what bland bungying, safe snowboarding, moderate mountain climbing, or pedestrian paragliding would do for us. Yet when it comes to politics the connotations are negative. Perhaps instead of fruitlessly trying to point out that Don Brash' ideas are NOT extreme it would be better to go with it. Yes. ACT the extreme party. You want extremism in your sport, in your leisure time, why not in your real life? Too chicken to try it? Just what this country needs. A bloody good dose of extremism. The yellow bellies can stick to National or Labour. All those types who are scared of their own shadow, the risk aversionists, the can't-even-hold-a-candle-to-a-hobbit mob. Shame on them. Brash is the choice for rugged individualists - now a rare breed in dire need of revival. Is Maori secularism ever offered? A new parenting programme targeted at Maori tells them they are inherently loving and nurturing caregivers and family violence has arisen only because of European missionaries. The pivotal point is should the way people behave be based on reason or faith? Or perhaps a mix of both? "Maori people want to see their own culture reflected in programmes. This is uniquely Maori and is based on our history and legends. It gives us a whole lot of values that possibly many of us didn't realise we had." Plans are under way for Plunket to pilot the programme in Hamilton. The report researched the treatment of children using oral histories, poems, and European observations. It traced Maori history from the separation of Ranginui the Sky Father and Papatuanuku the Earth Mother through to early Europeans' reports of children's relationships with whanau. Mythology has long been used by all cultures to teach and provide meaning. This practice seems to particularly appeal to Maori. Or is that just the imression we get? Surely Maori secularism also exists? But I remember a recent post where I referred to the Maori all- or- nothing view, "the scared or the profane", acknowledged in a public service policy document. So is secularism only ever bad in Maori eyes? My secularism is based on reason. I trust myself before I trust anything I can't see or hear evidence of. But I don't think I am lacking in some degree of spiritualism which I find in music, art and nature. And, when I think about it, my love for my children who are an essential part of my wholeness emotionally. So why would I ever abuse or neglect them? My reason tells me to do so would be an act against myself. Isn't that what troubled people need to understand? Forget all the extraneous stuff about "you are like this because aliens taught you to be a hundred years ago." You are in control. It's your life and you own it. The change has to come from within the individual. Otherwise when it all goes pear-shaped the out is to go on blaming someone else. Maori culture, as described in this article, is positive. But its absence leaves a vacuum. Maori need to work on filling that vacuum with some grounded, here and now, cause and effect, education.